Anderson's Autoclavable HA Sanitary Pressure Transmitter is specifically designed for critical measurements in fractional size lines. Developed from the highly stable "Mini" HA Pressure Transmitter, the Autoclavable HA takes the versatility of a small form factor transmitter to the next level by withstanding the stress of the autoclave environment. Its one-piece stainless steel package design incorporates a transducer and electronic circuitry to convert pressure and/or vacuum to a proportional 4-20 mA signal. 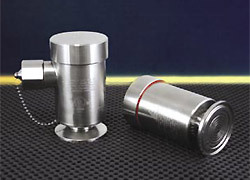 The product can be ordered with 1-1/2" Tri-Clamp® connection or our CPM fitting that eliminates hold-up volumes in process lines. All units are supplied factory calibrated to standard or custom ranges. For field maintenance, non-interactive zero, and span adjustments, as well as easily accessible test points that greatly simplify calibration and validation. 316L stainless steel wetted parts are electro-polished to an Ra=8. Finally, since it’s an Anderson Pharmaceutical Series product, every transmitter includes calibration and material certificates and permanent tag at no charge. Tri-Clamp® is a registered trademark of Alfa Laval Inc.